Day 1 of the 2017 World Jiu-Jitsu Championship, this Thursday, at the Long Beach Pyramid, was a 14-hour Jiu-Jitsu marathon. White, blue and purple belt athletes took to the mats for a full day of action under the direction of some of the most well known black belts in the world. Marcelo Garcia, Gui and Rafa Mendes, André Galvão, Erberth Santos, Leandro Lo, Braulio Estima, Mackenzie Dern, Mario Reis, Luiza Monteiro, Marcio Pé de Pano, Hannette Staack, Dominyka Obelenyte among many, many others, spend their entire day (or at least a good part of it) yelling instructions to their students or teammates. The day featured some of the most populated weight classes of the entire tournament. The blue belt lightweight division held the record with 118 athletes. 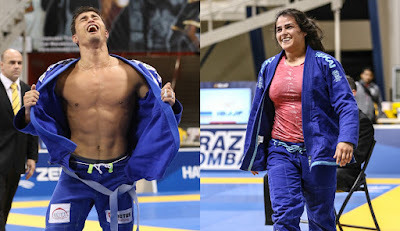 Champion Jonatha Alves fought seven times to get the gold medal.